BC High running back Danny Abraham (No. 27) will likely leave defenders in his wake again this season as one of the 20 EMass Players to Watch. Danny Abraham, BC High — As a junior, the stocky back mixed jaw-dropping performances — namely a 385-yard, four-touchdown effort in the season opener against Andover — with more lean efforts, ultimately unable to find any sort of success against D1 South rival Xaverian. The Harvard commit is a smart player with breakaway speed. Khalil Blair, Cathedral — The Catholic Central Small MVP as a junior, the fleet-footed Blair paced Division 4 in scoring (31 touchdowns) while churning out 2,189 total yards. He’ll be the centerpiece for the Panthers again. Smith Charles, RB, Milton — The state’s most explosive sprinter indoors and out, the junior will receive more touches this fall in coach Steve Dembowski’s dynamic attack as a runner and receiver. Nick Correia, Nantucket – Cory Ryder has taken his massive frame to William & Mary, but the Whalers have another force in the 6-foot-5-inch, 340-pound Correia, who has an offer from Rhode Island. Hunter Ferreira, Mansfield — The 6-2 senior wideout hauled in 53 catches for 833 yards and six touchdowns last fall, emerging as one of the region’s top receivers. Devaun Ford, Mashpee — After scoring 24 touchdowns last fall in the Falcons’ flight to the Division 4 Super Bowl victory, the junior will take over as the lead tailback. With elusive speed and catching ability, Ford is a dual threat who is poised for a big season. Scott Elliot, Holliston — The 6-3, 282-pound junior lineman already is a three-year starter who received an invite to the Army All-American Combine in January. He’s already attracting D1 looks. Jerrod Clark, Brighton — A starting forward on Hugh Coleman’s Division 2 state champion basketball squad, the 6-4, 230-pound tight end has committed to Coastal Carolina. Shane Frommer, King Philip — If the Warriors are going to make a run at a repeat as champion, their quest will start in the backfield with Frommer. A Yale recruit, the elusive 5-11 tailback produced 1,110 yards and nine touchdown last season. Sal Frelick, Lexington — A gifted dual threat who is coming off a starry breakout junior campaign (31 TD passes, 21 more rushing scores), the 5-9 QB is the perfect pilot for coach George Peterson’s fast-paced, at times frenetic, offensive scheme. Calvin Johnson, St. Mary’s — The fleet-footed senior makes the shift from receiver to QB after a 31-touchdown, 2,000-plus yard season in a junior season in which he was the Catholic Central Large MVP. Gates Kelliher, Falmouth — The senior is a three-year starting fullback/linebacker for the defending Division 2A Super Bowl champs. He produced 95 yards and three touchdowns in the final, “the best player in the Super Bowls” according to his coach, Derek Almeida. Jack McNeil, Marshfield — One of a handful of returning Globe All-Scholastics, the senior back delivered 1,000-plus yards last season and scored 21 TDs. He also recorded 74 tackles at free safety. He’ll be an impact player in coach Lou Silva’s final season on the Ram sideline. Issac Nascimento, Wareham — The Globe’s reigning Division 3A Player of the Year averaged 9.3 yards per carry and racked up 27 touchdowns and 2,049 total yards, (1,793 rushing) for the 8-3 Vikings. Chad Peterson, North Attleborough — As a sophomore, he set the program record for completions (96) in a season. He broke his own record last year with 110. His 23 touchdown passes last fall were the second-highest total in Division 2 (now D3). Kevin Pyne, Millis — The 6-7, 265-pound sophomore tackle is already a five-star recruit for the class of 2020. 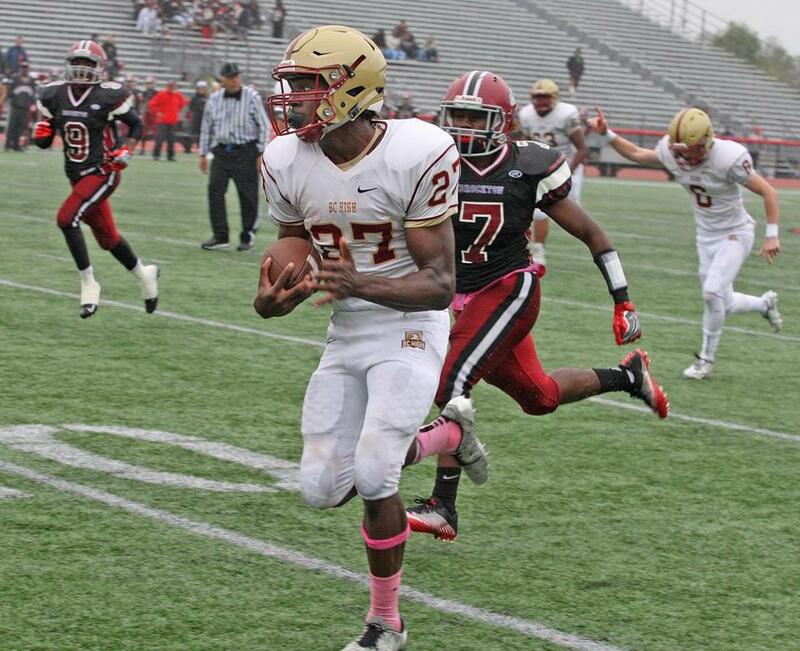 Boston College, Florida State, Michigan, and a number of others already have made offers. Ryan Quinn, Billerica —The four-year starting linebacker is a two-time all-Merrimack Valley Conference selection who piled up 221 tackles and three interceptions for the back-to-back North finalists. Mike Sainristil, Everett – Ashort (5-8) and compact, electrifying receiver and corner, Sainristil notched interceptions in multiple Crimson playoff wins and also showed dynamic breakaway speed as a kick returner. The junior will line up alongside Anthony Norcia on offense and Jason Maitre on both ends, forming a formidable two-way duo. Brandan Blom, Karl Capen, Brendan Hall, Ryan Hathaway, Cole McNanna, Owen Pence, Lenny Rowe, Dan Shulman, and Nate Weitzer contributed to this report.